The Treeing Feist is a small hunting breed that, as its name suggest, works as a treeing dog. Like curs and coonhounds, these dogs were developed to track its prey and then force the animal into a tree. Once it is treed the dog will continue to bark or bay until the hunter makes the kill or the dog is called off. They are capable of taking on small prey such as squirrels, raccoons and opossum, as well as larger game like bear, bobcat and mountain lion. The Treeing Feist is descended from working dogs that were kept in the southern United States solely for the purpose of being able to bring home food. Their ancestry included any dog that was able to get this job done and often included crosses of hound and terriers. Eventually these working dogs became rare do to the change in needs of the regions and in the 1980s enthusiasts began to selectively breed them for recognition. 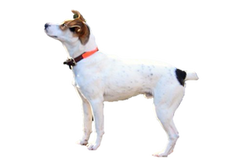 Although several different feist types remain today, the Treeing Feist remains the only one that has been recognized, although sometimes the Rat Terrier is also grouped in this same category. Is the Treeing Feist Right for You?